I know you are excited to start with your clarinet, but let’s get a few things in place before you pick up your instrument. In order to play properly you first have to sit up straight. This allows you to breathe deeply and support the sound of your instrument as breath controls all of the sounds you will be making on your trumpet. One way to do this is to stand up, bend at the waist with your arms hanging loosely to the floor. Now slowly roll up, aligning your spine so it is straight up and down all the way to your head with your arms at your side. Think of a string pulling straight up from the top of your head stretching your body out. Shrug your shoulders up and down, then back and forward. 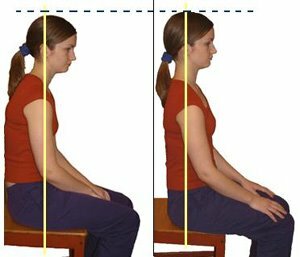 Your shoulders should sit in a relaxed position at rest between each of these places. Now, sit on the front edge of your chair and do the same thing. This puts you in the proper position to support your sound by breathing deeply. Flatten your bottom lip and make sure the red part of your lip is over the ridge of your bottom teeth. (Pretend you are putting chap-stick on the lip). Avoid having the red part of your lip all on the inside of your teeth (or outside). 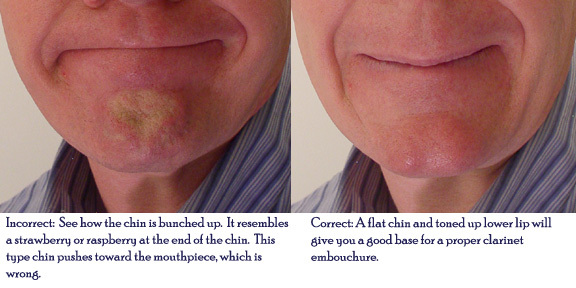 Along with the flattened lower lip, also notice your chin is flat or pointed as well. Do not allow strawberries or raspberries to form at the end of the chin. This berry motion has your chin squeezing in an upwards direction. Toning-up or flattening the chin has the skin of your chin moving in a downward position. Bite down with the top teeth onto the mouthpiece putting 1/4 inch of the mouthpiece into your mouth. 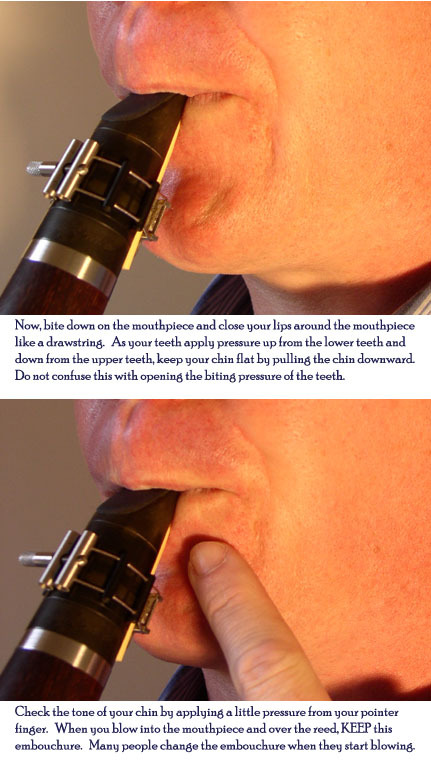 Close your mouth around the mouthpiece like a drawstring. If you were to make vowel sounds with your mouth, you would start with Eeee and slowly change the mouth to Oooo or Uuuu. Therefore, try this, say EeeeOooo. Notice how round your mouth is. 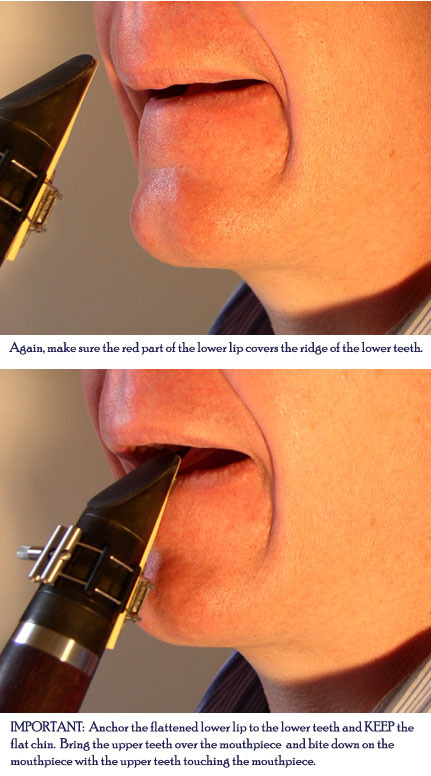 The top lip, corners, and bottom lip should all have equal pressure on the mouthpiece/reed. Another way to think about the top lip is to say Rrrr like a dog growling. Now, close off the lips so air can only blow into the mouthpiece. Keep the chin flat. 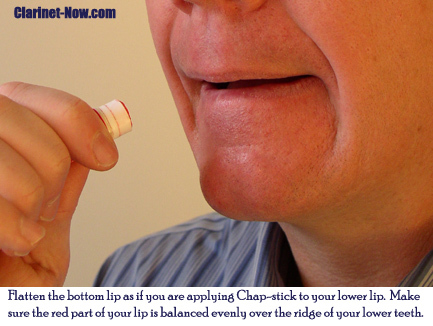 As you close your mouth and seal it, pull the chin down and make the skin between your chin and lower lip stretch. (Be careful NOT to open up the pressure of the bite. This is a common mistake and misunderstanding). 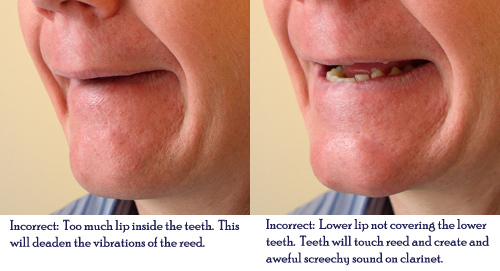 Now, with your right hand (under the thumbrest) place some pressure against the upper teeth. BLOW – when breathing, only use the corners of your mouth to take air into your lungs. Keep the same pressure and do not interrupt your flat chin to do this. Many students completely open their mouth to breath and the most efficient way to breath is to use the corners of your mouth. 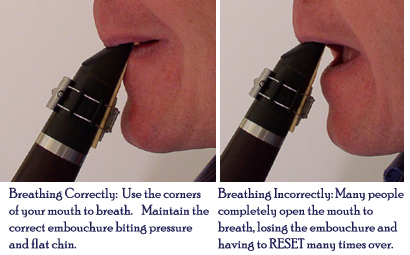 Now that you have basic breathing and embouchure, let’s make sure you can hold your instrument properly. The major rule of clarinet hand positions is that your hands should be in a natural position. Below, details are given for each hand. The left hand thumb covers the hole underneath the upper joint and the top left corner of the thumb needs to sit past the tone hole and lightly touch the right hand bottom edge of the register key, see Figure 3.2. Beginners will not be using this register key for a few months but to save trauma later it is best to explain the operation of that key at an early stage. 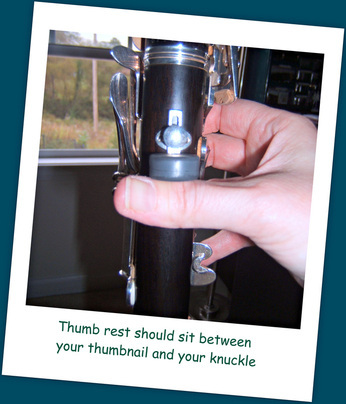 Unlike the right thumb, the left thumb has four different positions: Covering the tone hole to stop the air escaping. Covering the tone hole and depressing the register key at the same time. Hovering above the uncovered tone hole to let the note “(open)G” sound. 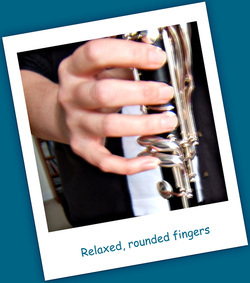 This is the hardest position for beginners as the clarinet must be steadied by the right hand thumb (with no fingers of the right hand covering tone holes) and the embouchure (which is a French word used to describe the position our face needs to be in to play the clarinet). Operating the register key without covering the tone hole. In this instance it is not acting as a register key but in conjunction with the index finger of the left hand operating the “A” key to make the note Bb. When playing, our head has to be looking ahead, in a straight angle in relation to our body. Legs have to be a bit sepparated and the body has to be straight, though in a confortable position. The clarinet should form a 30-45º angle in relation to our body.